A friend recommended this when I was pregnant with my first. We have a beloved calico who had been Princess of Everything to that point and I'm sure she would give Socks' story five purrrs and empathize with him wholeheartedly (though thank goodness we did not have to go to any extremes with her like they did with Socks). I actually didn't get around to reading this until after my second was born and I'm glad I waited because the story is even more poignant and humorous and heartbreaking and sweet and wise when Socks is seen not just as the displaced cat but in the older sibling role. I'm sure my oldest son could relate to Socks, too! I could empathize with the new parents, so caught up with their baby and desperate to ensure his well being, though I do wish Socks hadn't been put into one situation. Still, it served it's purpose and, while I don't want to give any spoilers, I will say that I was happy with how the story ended. I've never been a Cleary fan but I really liked this book and felt she did a marvelous job getting inside the head and heart of the "older sibling" (be that a fur-baby or human child) as well as these of the new parents who loved them both. OMGosh. I laughed so hard. Beverly Cleary is surely a cat person, because she has totally pegged the way a cat acts and thinks. Poor Socks has a terrible time when his family brings a baby named Charles William home to live with them. His antics trying to regain their affection are adorable. Cleary's spare, understated prose lend to the appeal for kids, and although it was first released in 1973, any cat lover today will howl with laughter. If you don't enjoy this book, then you're probably a dog person. I adored this when I was young (even though I was a bit older than the target audience when it was released) and was delighted to find that I still do. So much wisdom, insight, adventure, and humor packed into such a very short book. Perfect for a family read-aloud for all ages. Even minor characters are full-on individuals.And since it's a cat displaced by the baby, it's 'metaphorical' and you can apply it as bibliotherapy to your first-born without being dismissed as teachy-preachy. We haven't read as many books by Beverly Cleary together as I thought we would, but every once in awhile, I sneak one in. I think at this point, I will encourage our youngest to read them on her own, since many of them are still age-appropriate for her. She brought this book out from our bookshelves and read it for her independent reading for school and I read it after she did. It's an entertaining story about the cat of a household and the turmoil that disturbs his happy life when a baby joins the family. The story is quite dated and I'm not sure this book has the timelessness that others have, but it's still an entertaining read. Our youngest also brought home Ribsy from her school, so we'll likely read this one next. Socks is a white-footed kitten taken in to a perfect home: he always has a lap, and is generally spoiled... until the day the baby arrives. Now his position in the household is threatened by the new pet. It's a wonderful story about the impact of a baby from the cat's perspective - dated by a couple of passing references, but not too obviously for children - and the adaptations made. A good reminder for any new parents with pets, as well as for encouraging empathy in children! Being as big a fan of Beverly Cleary as I am, I can't believe I hadn't read this one before. As it turns out, I think this book would be a good read not only for elementary school-aged kids, but also for first-time expectant parents, especially those with pets, and also parents who are expecting their second child (to gently remind them not to inadvertently neglect the first-born).Socks is a cat who was adopted by a lovely couple. He had a happy life until the day the couple had their own baby. As the first-time parents fussed over their precious Charles William - with a certain amount of comical cluelessness that I recall from my own first days as a new parent! - poor Socks was ignored, overlooked, and actually relegated to the laundry room. The good news is, there is a happy ending. But along the way, I really felt for Socks! Poor thing. He deserved better. Purrfect! I thought my 6-year-old might read this on his own, after he requested a book about a cat, but I ended up reading it to him and his 8-year-old brother. Socks reminded us of our grey tabby, Pete. It was good, but too sad. This was my ME book when I was a kid. It meant everything to me. An amusing tale about a cat who has to share his owners and his home with the new pet called 'baby'. Cute little view of a baby from the pet perspective. Do you know how sometimes you find just the right book for the moment? As a bit of serendipity, Socks written one year before I was born found its way into my families' life at just the right moment this year. My daughter is five-years-old now and a few months of ago we welcomed her brother into the family. The new addition hasn't been 100% smooth. As anyone that has lived with a five-year-old and a new born will attest they both demand a good bit of attention. Particularly when the five-year-old has been used to getting all of the attention as a single child. When a new baby arrives, there is bound to be a bit of upheaval as roles and routines in the family inevitably shift. Socks, a book about a cat, captures this upheaval perfectly in a way that no "big sister" book could.I picked up the book because my daughter is obsessed with cats and thought it would be a good possible read-aloud for bedtime, and it proved to be just that. Beverly Cleary clearly knows cats. She captures Socks actions and implied motivations perfectly. My daughter loved the illustrations and each of the actions of the cat. However the underlying story is what drew me and my wife to really love the this book. The challenges of new parenthood are captured just as accurately as the life of a cat as well as the ups and downs of pet ownership. Most importantly the themes of family love and belonging are central to the tale and make the an enduring story for any kid experiencing a new sibling.We aren't sure that our daughter caught on to the parallels between her and Socks, but the story was engrossing and a perfect bedtime treat for all of us. We look forward to reconnecting with more Beverly Cleary books, an author both my wife and I read some of as children. This book for young readers is told from the point of view of Socks, a kitten with white feet who becomes the beloved pet of a young married couple, the Brickers. The first chapter takes place outside a grocery store where a brother and sister are trying to find homes for their "nice, fresh kittens." When a harried looking mom with too many children agrees to take Socks, the siblings hide him in the mailbox. They don't want their favorite kitten to be mistreated by too many little hands.The Brickers, though, do not turn out to be the best adoptive parents. Though Socks is well cared for, the Brickers soon have another pet on the way and this creature, Charles William, consumes their attention. Poor Socks. He finds himself shut in the laundry, and then banished entirely from the house. It's only when he gets into a nasty brawl with a much bigger cat that the Brickers finally take notice…This is a clever book. I have read it before. This time I read it out loud to my four and a half year old daughter. The reason I gave it three stars is that I think the shift from the brother and sister giving away kittens (first chapter) to the Brickers (second chapter) is confusing for younger readers. Having everything from the cat's point of view, while wonderfully clever, makes the book a little hard to follow and the story a little fragmented. While that mimics an animal's consciousness quite well, I found that the book did not hold my preschooler's attention as much as other Beverly Clearly books have. Socks is written in true Beverly Cleary style. The cat for whom the book is named was the Bricker’s only pet, pampered, loved and a little spoiled. But his mistress’ comfortable lap began to shrink, and then one day Mr. and Mrs. Bricker brought home a new pet. One that wailed and smelled funny and stole all the attention that used to be lavished on Socks.Written for ages six to nine (though probably independent only for the upper half), Socks will resonate with any child who’s owned a pet or been part of an expanding family, and it will lend the experiences to children who haven’t. It’s a light-hearted read, told from the perspective of a slightly selfish, slightly arrogant cat who gets into lots of mischief, from stealing wieners off the counter to destroying Nana’s wig while she sleeps. And can’t every kid identify with being just a little self-centered and naughty? Socks’ antics are sure to draw lots of smiles.Cleary’s works always includes an overarching theme of family – of love, acceptance and togetherness – and this one’s no exception. The Bricker’s family simply includes a rambunctious but loveable, four-legged member named Socks. I have read Socks so many times. I could basically give a review of this book, to where I would spill out the entire story. So right now, I will give a brief review.The story starts out where a little girl and a boy are trying to sell their kittens. The kittens ARE selling, which makes the girl scared. She has a special kitten named Socks who she loves the most. No matter what her pleads or cries, a couple decides to adopt Socks, and nothing could stop them. As Socks is living with the couple, he learns the privliges and necessities of the house. As Socks just starts to get used to the home, something is happening. The lady is about to have a baby, and that will change his life forever. For someone who didn't read Beverly Cleary as a child, I sure have read a lot of her stuff (with my kids) as an adult, and it always leaves me wondering, "Why didn't I read more of her books as a kid?" She's a good writer, entertaining, and very good at capturing the essence of a situation or character. In Socks, she does a wonderful job of giving us the perspective of a cat and, towards the end, a baby. I don't even like cats or babies very much (sadly, it's true . . . don't hate me :), but I really enjoyed this book. My 5-year-old son, with whom I listened to it on tape, also enjoyed it very much. Neil Patrick Harris is the voice to many of Cleary's books on tape (Henry & Ribsy books) and he does a great job. This was far too cute and funny for anything less than 5 Stars! Socks is an awesome little cat who reminds me so much of my own furball, Merlin. I am so glad I picked this up as part of Lesley's #ReadKidsLit project. Makes me want to dig out all my other Cleary books and take a stroll down memory lane. It's not only third-graders whose heads Beverly Cleary can get into. She also channels cats. Socks is totally believable and adorable in every particular. He's bewildered by the appearance of a new baby in his family, and how he copes with the changes which ensue is both comical and poignant. The babysitter is priceless! I want to grow up and be the babysitter. This book is about a cat who gets adopted by a nice couple. Later in the book the cat´s owners have a child and the cat starts to feel left out. (The cats name is Socks).I would not recommend this book to my friends only because this book is more of younger child book. But I would recommend this book to younger children. This was cute :) Can't wait until Jack is old enough to enjoy books like this! I read this when I was a kid and loved it. I read it again and still love it. This book made me bawl my eyes out as a child. Loved it. This is the first chapter book I ever read. I remember my 6 year old self adoring it! Great for young readers. The book that I read and really enjoyed was called, "Socks," by Beverly Cleary. "Socks," is the story of a young cat who has been put up for adoption by his previous owner. He gets adopted by nice owners and lives a happy life with them, until, one day his owners bring home a baby. In this wonderful and humorous story, Socks attempts to find a way to get back into his owner's hearts again. I really liked this story because, first of all, I really like cats. Also, because of the way that the author wrote it, which really engaged the reader. I also like the main idea of this book, and really just the feeling of a heartwarming story. Beverly Cleary is an amazing author and I really like her books! 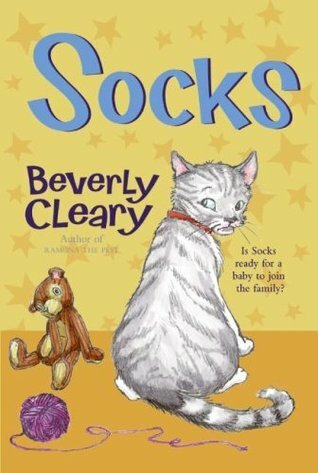 I would definitely recommend, "Socks," or any other books written by Beverly Cleary, to people that like humorous stories, or stories related to animals. Basically, this book would be great for anyone that likes fiction, and kid's stories. In conclusion, I really enjoyed this book and I think that it was definitely one of my favorites. The book was good because it was a very fun and interesting topic , something which I haven’t read before . It was a family type story to me and that is what made me read it . The beginning was a bit boring but as the story proceeded i started to like it . I could relate to to story as well which also made me want to read the book and see if the characters change or stay the same . I would rate it 3 or a 3.5 out of 5 stars . This isn’t the first book i read of Beverly Cleary so compared to the other book “ Ramona and Bezzues” I thought of this book in a “ok” in a way . Overall the book was kind of enjoyable but it isn’t a book i would reach over to read during my free time .